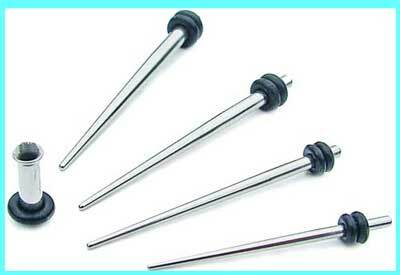 Ear stretching starter kits - Set of 4 high grade surgical steel ear expanders / tapers and 1 flesh tunnel . If you're thinking about starting to expand your ear piercings then these are a great way to start, as long as your ear piercing is fully healed then you can start slowly making the hole bigger. 1x 1.6mm surgical steel ear expanding spike. 1x 2mm surgical steel ear expanding spike. 1x 2.4mm surgical steel ear expanding spike. 1x 3.2mm surgical steel ear expanding spike. 1x 3.2mm surgical steel flesh tunnel with "O" ring. Powered by ShopFactory to sell P8644 online. All-in one eCommerce and online shopping cart software.